If you are interested in beginning the process of counselling and psychotherapy, Bonnie Mason will guide you through the process by assisting you in finding the best match for your needs. One of the many ways we work towards the healing process is by making every effort to ensure that you are matched with someone you will feel comfortable with from the start. We take into consideration a therapist who may have specialized training or area of focus for the presenting issue, age of the client, treatment preference, and insurance requirements, just to name a few. The associates are all Registered Clinical Counsellors (R.C.C.) with the exception of Teal Maedel who is a Registered Psychologist. They bring a wealth of experience and skills in many different therapeutic areas. These professionals are all highly competent therapists dedicated to a compassionate approach to all clients. They all have the ability to make deep and respectful connections and strive to achieve the therapeutic goals of their clients. Given the extensive wealth of training we all bring to the practice, at times when there are multiple family members involved there may be a few therapists assisting from the practice. Having the therapists work together to assist you can often bring about healthy resolution to family or marital conflict. Please see the links for each associate for more information on their credentials and areas of specializations. 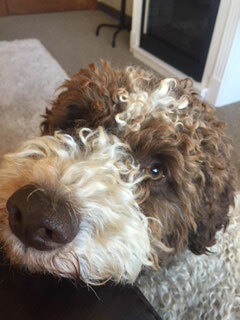 Enzo is a Lagotto Romagnolo who is a very sweet, non shedding, medium sized dog. Also known as the Italian Truffle dog, he is very social, loving and deserves much attention. He can often be found assisting Bonnie with her work helping adults, teens and children feel relaxed and less stressed. Enzo never tires of attention and enjoys assisting Bonnie at the office.